A small startup company claims it has made a breakthrough in the field of resistive RAM (ReRAM) which will lead to non-volatile mobile memory chips capable of holding 1TB of data. Resistive memory is one of the technologies positioned to take over from traditional NAND flash and even high-speed volatile DRAM, using changes in resistance to store data. Because it's non-volatile ReRAM takes considerably less power than dynamic RAM as it doesn't require a constant refresh cycle, yet offers performance significantly better than that of existing non-volatile memories like NAND flash. The technology has been a long time coming, however. The theory is decades old, and patents can quickly be found dating back to 2001. Elpida made a prototype device last year, but it's only with the launch of a microcomputer from Panasonic that the technology has hit mass production - and even then, in tiny quantities. Crossbar, a small California-based start-up, claims it is going to become the next ReRAM giant - and will do so by offering a chip the size of a postage stamp that can offer tomorrow's mobile devices 1TB of storage with a performance some 20 times greater than traditional NAND flash components. The ReRAM array produced by Crossbar, which the company is choosing to call RRAM, proves the company's technology works in the lab - and it claims the process can scale up to produce a 1TB storage component just 200mm² - smaller than the area of an average postage stamp. Using 3D chip-stacking technologies, this could be extended to multiple terabytes in the same footprint, the company adds. 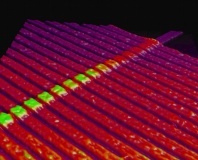 It's not just about increasing the amount of data that can be stored in a mobile device, but the performance - and Crossbar claims its RRAM array wins there, too. 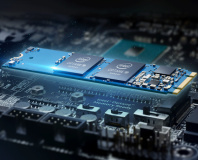 The company is bandying about some impressive figures, claiming a 20-fold speed boost over NAND flash and a 10x boost in endurance. The company also claims that a RRAM array draws one-twentieth the power of best-in-class NAND flash and takes up half the footprint. The RRAM array is based on a layered structure, where a non-metallic bottom electrode provides a base for an amorphous silicon switching medium and a metallic top electrode. When a voltage is applied, a filament forms in the switching material between the two electrodes - altering the resistance of the material. It's an implementation of ReRAM the company claims can easily be produced at any standard CMOS manufacturing fab. So far, so impressive - but the small start-up has a way to go: it hopes to launch both standalone chips and also partner with system-on-chip (SoC) builders to integrate RRAM arrays into their next-generation products, but has not yet provided a timescale for either plan to come to fruition. 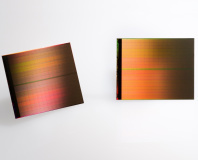 The company has, however, produced prototype RRAM arrays using a commercial fabrication facility - suggesting it isn't as far away from mass production as its rivals - and claims to be in the final stages of characterisation and optimisation. Devices for servers and gamers alike.